A tiny Digimon which has cat-like characteristics. It is always capricious, and that behavior seems to have been attached to Nyaromon as a result of its being like a "cat". Although it is sometimes frivolous due to its overflowing curiosity, it also has a lonely side. Its Special Move is puffing up its tail, making the hairs like wires and then striking the opponent (Fox Tail). However, there has never yet been an opponent observed to flinch from this attack. 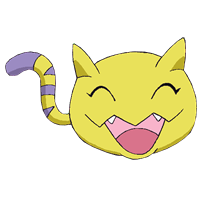 A tiny Digimon which has cat-like characteristics. 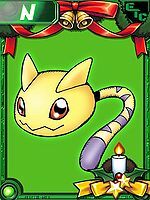 It is always capricious, and that behavior seems to have been attached to Nyaromon as a result of its being like a "cat". Although it is sometimes frivolous due to its overflowing curiosity, it also has a lonely side. 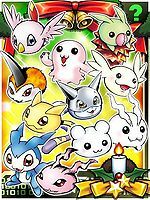 It is always capricious, and that behavior seems to have been attached to Nyaromon as a result of its being like a "cat". Although it is sometimes frivolous due to its overflowing curiosity, it also has a lonely side. Comes from nyaa (にゃあ~), which is the sound cats make in Japanese. Awa  泡 Bubbles Bubbles Spits out bubbles from its mouth. Nyaromon is the partner of Yagami Hikari. Her Digitama was separated from those of the other Chosen Children's Digimon when a young Gennai dropped it after fleeing from Piemon. She hatched and she wandered the Digital World alone. Also appeared in Hikari's vision as the partner to a little boy, when Belial Vamdemon cast his Mental Illusion. 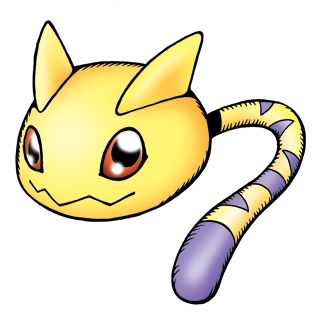 A Nyaromon was part of Togemon's elementary school. 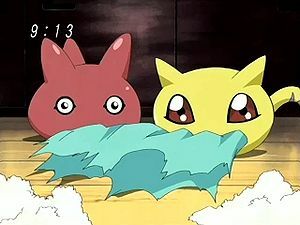 A Nyaromon is among the baby Digimon that Piyomon was caring for that ends blown to the human world by a tornado. They all end up in the care of Sayuri and Chika in the Daimon household. Evolves to Plotmon at level 11. Evolves from Poyomon, Punimon or Yukimi Botamon. Can evolve to Gizamon, Plotmon, Renamon or Terriermon. 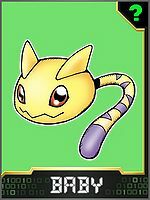 Nyaromon only appears in the opening animation of the game. Evolves from Yukimi Botamon. Can evolve to Agumon, Gabumon or Plotmon. Evolves from Bubbmon. Can evolve to Bearmon, Gabumon or Hawkmon. Evolves from Yukimi Botamon. Can evolve to Agumon (Twin R), Agumon Hakase, Gabumon (Twin L), Gaomon (Twin L), Gottsumon or Guilmon (Twin R). ↑ Digimon Adventure tri. - "Coexistence"
This page was last modified on 7 March 2019, at 20:56.